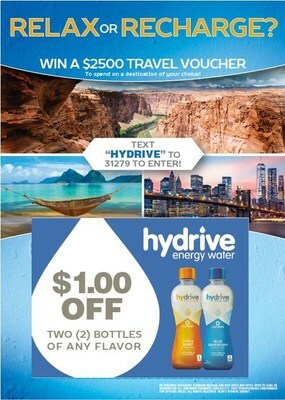 Consumers can text "HYDRIVE" to 31279 to be entered in the contest. "Hydrive Energy Water wants to give back to consumers who have made Hydrive the best choice for their zero-calorie energy water," said Thomas Oh, SVP of marketing for Big Red, the makers of Hydrive Energy Water. "Our fans are fit, active and on-the-go. We wanted to offer a prize that fits their busy lifestyle. By choosing their own destination, the winner can decide exactly what relaxation and recharging means to them." Hydrive Energy Water's new formula is light, refreshing and flavorful and features all natural flavors, zero calories and added B vitamins. The product line consists of four flavors including Black Cherry, Blue Raspberry, Triple Berry and Citrus Burst to rehydrate and recharge consumers. Hydrive Energy Water has zero calories, 160 mg of caffeine and 35% DV of vitamins and retails for $1.89 - $2.29/bottle. Hydrive Energy Water can be purchased nationally at major retailers. HYDRIVE Energy Water is light, refreshing and specifically formulated to provide consumers with the hydration benefits of water with the added perk of energy from B vitamins and caffeine. Hydrive Energy Water is available in four refreshing flavors: Black Cherry, Blue Raspberry, Triple Berry and Citrus Burst. For more information please visit HydriveEnergy.com and connect on Facebook and Twitter.